Advanced Controls Corporation provides comprehensive maintenance on all of our Mechanical Controls, Building Automation and Power Management Systems. Our professional team has the skill and experience to handle each project. We custom tailor our service agreements to the specific needs of our customers. Depending on your needs we can ensure that a tech be available for emergencies 24/7, during holidays, and arrive onsite in a time frame of your choosing. Our mechanical services team is composed of U.A. journeymen with EPA certifications to handle a wide range of HVAC systems and services. Our range of expertise includes small commercial offices to large, complex industrial facilities, particularly in the healthcare field. 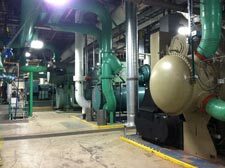 We specialize and provide service of chillers, boilers, pumps, cooling towers, and ice machines as well as air balancing. We are Certified GSA Contractor for Mechanical Services work – GS-21F-158AA.